7 Nights All Inclusive Acc Per person in dbl room . 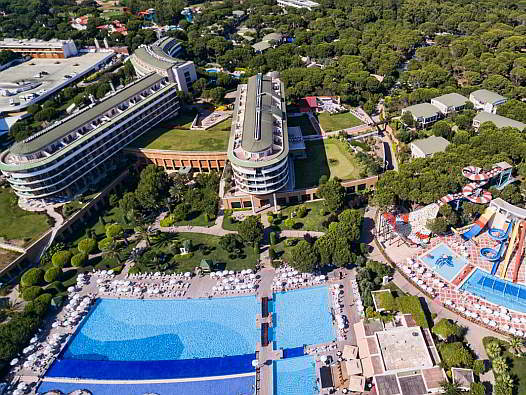 Voyage Belek Golf Spa is a 5 Star Hotel with Ultra All Inclusive service. The Hotel is build on beach front over a 93.500 m2 area and has 700 rooms. Voyage Hotels adhere to architectural designs that are in harmony with nature. Voyage Belek Golf Spa, the newest addition to the hotel chain, has also been designed with this concept in mind. Residing like a jewel in the midst of the pine forests of Belek, Voyage Belek Golf Spa incorporates the concepts of modern design and harmony with nature in its architecture. Voyage Belek is 40 km from Antalya city centre, 35 km from the airport and 2 km from Belek. The hotel, situated on an area of 93,500 m2, operates on an ultra-all-inclusive system. 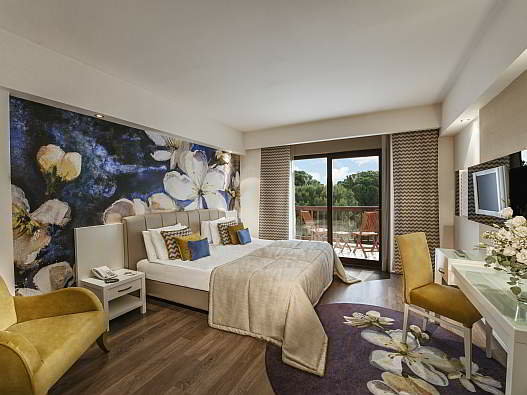 Voyage Belek consists of 1 main building, 2 side buildings, bungalows and the newly built Laguna Duplex villas. The large number of à la carte restaurants, limitless choice of food, golden sandy beach, 10 pools with different characteristics (Between 01.11.2014- 01.04.2015 Voyage Belek provided outdoor heated pool and indoor pool ), an exclusive fun fair for children and many more countless entertainment and play facilities make the Voyage Belek Golf & Spathe ideal holiday choice for families. During the construction of the Voyage Belek natural habitats and forest terrain were mostly preserved. One of the best examples of this can be seen in the reception building. Other indicators of the resort’s dedication to the environment are the clean-up activities carried out in the Belek Forests and traditional tree planting days. The resort, which most recently received the “Top Hotel Prize 2012 in the TürkischeRivieraRegion” from Holiday Check, “Gold Awards 2011” from Tui UK First Choice Premier and the “Certificate of Excellence 2011” from Tripadvisor.co.uk, has been listed many times in Neckermann’s, one of Europe’s largest tour operators, “Top 100 Hotels Primo” ranking. The Voyage Belek Golf & Spabeach consists of fine sand without any pebbles or rocks, which is rarely found in the Belek region. Also, the coastline is home to the carettacaretta turtles and the resort hosts these lovely guests with exclusive conservation areas. 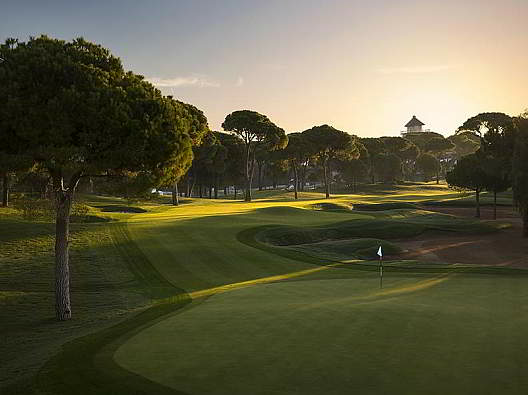 In 2008, the Belek region, where the resort is located, received the “Golf Destination of the Year – Europe” award from IAGTO (International Association of Golf Tour Operators). Furthermore, various “environmental awareness week” activities such as cycling tours and picnics are organised at Voyage Belek Golf & Spa. Voyage Belek Golf & Spa also draws attention not only with its restaurants and patisserieand bars, which will be your flavour station throughout your holiday, but also with its rich food & beverage service continuing all day long. Voyage Belek Golf & Spa’s main restaurants with impeccable service quality and à la carte restaurants, elaborately picked out of various world cuisines, welcome their guests with their distinctive interior design and rich selection of food. Apart from the main restaurant, the resort has an Adult restaurant, 8 different à la carte restaurants (between 01.11.2014-01.04.2015 3 a’la carte testaurants) and 1 snack restaurant & patisserie. The rich food & beverage service also draws attention with aperitifs and light snacks offered in addition to the main courses and children’s menus. Furthermore, Voyage Belek Golf & Spa has 14 different bars (between 01.11.2014-01.04.2015 5 bars) operating at various hours of the day. Starting with stretching in the morning, pool and sports activities, the animation programme at Voyage Belek Golf & Spa continues throughout the day. The evening animation programme includes live music performances, Show Time in the amphitheatre with different acts every night. Mini cinema, game rooms, 2 beach volley field, tennis (4 tartan floors, rackets & balls), mini football, aerobic, water sports, fitness center, dart, mini golf, table tennis, American billiards, bowling, boccia, badminton, game center, air rifle, archery, putter area (with 9 holes just for golfers) are available free or additional charge at Voyage Belek Golf & Spa. At Voyage Belek you may choose between water sports free of charge and those which are subject to an additional charge. Water sports offered pedalo, canoe, wind surfing (with license), banana, jet ski, catamaran, ringo, wind surfing, parasailing, water ski are free of charge or additional charge. Water sports are only available during the summer season. All Packages Per person in dbl acc all inclusive concept & Include : Golf Shuttles & Airport Transfers & Free Welcome Drink! !